The Automated Transfer Vehicle (ATV) is an unmanned spacecraft designed to ferry supplies and hardware to the International Space Station. A huge, unmanned cargo ship arrived at the International Space Station today (March 28), delivering tons of fresh supplies for the six-man crew of the orbiting outpost. After five days chasing down the space station in orbit, the European Space Agency's third Automated Transfer Vehicle (ATV-3) arrived at the complex at 6:31 p.m. EDT (2231 GMT). The vehicle is carrying about 7 tons of food, water, clothing, experiments and fuel for the space station in what is the heaviest load ever delivered to the outpost by a robotic spacecraft, ESA officials have said. The ATV-3 flawlessly docked at a parking spot on the station's Zvezda service module using a sophisticated laser guidance system, as both vehicles flew 240 miles (386 kilometers) over the South Pacific Ocean. Dutch astronaut André Kuipers and Russian cosmonaut Oleg Kononenko were on hand to monitor the docking operations from inside the Zvezda module, NASA officials said. "The capture was soft," one of the astronauts radioed to mission controllers. "We didn't even feel it." The rendezvous and docking was managed by operators at ESA's ATV control center outside of Toulouse, France, as well as by NASA officials in Mission Control at the Johnson Space Center in Houston. The European Space Agency's ATV-3 approaches the hatch of the Zvezda service module on the Russian segment of the International Space Station on March 28, 2012. To celebrate the ATV-3's arrival at the space station, Dutch music group Love & Mersey, a Beatles tribute band, recorded a music video called "Back at the ISS." The musical greeting, which features lyrics in English, Dutch and Russian, has already been shown to Kuipers, Kononenko and the four other residents of the space station. The cylindrical, 13-ton cargo ship is 35 feet (10.7 meters) long and 14.7 feet (4.5 meters) wide and is so large it can fit a double-decker bus inside. The disposable spacecraft will remain attached to the space station for up to six months before the astronauts load it with garbage and deliberately send it to burn up as it re-enters Earth's atmosphere. 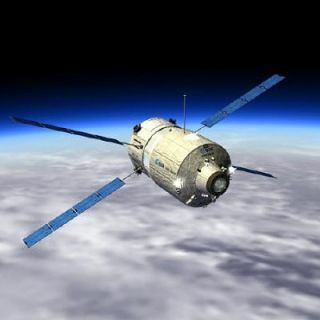 The ATV-3 launched into space on March 23 from Europe's South America-based spaceport in Kourou, French Guiana. The spacecraft is named "Edoardo Amaldi," after the celebrated Italian physicist who is credited with helping to create the European Space Agency. Amaldi is also one of the founding fathers of CERN, the particle physics laboratory along the Swiss-French border that houses the Large Hadron Collider. ESA names its ATV vehicles after historical figures in astronomy or space exploration. The agency's first ATV, Jules Verne, made its maiden flight to the space station in 2008. The ATV-2, named Johannes Kepler, followed in 2011. Europe's next two planned ATVs, named ATV-4 Albert Einstein and ATV-5 Georges Lemaître, are currently scheduled to launch to the International Space Station in 2013 and 2014, respectively.